This BBC series offers a fresh look at an amazing organization and mankind's quest to understand the universe. Blending stunningly restored footage with revealing, insightful and engaging interviews with the people who were there - the astronauts, family members and journalists - this is an epic story of the heroes, the triumphs and the tragedies of space exploration. Starting with NASA's beginnings in the Cold War, the series follows the iconic moments of space exploration from the race to get the first man in space to the first steps on the moon. 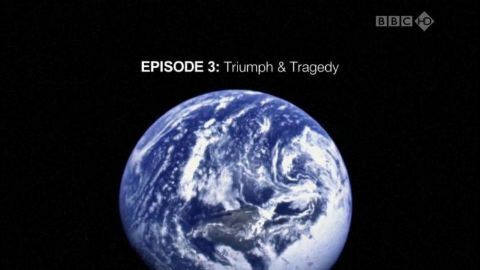 And with triumph and achievement comes risk and disaster, as the series follows the white-knuckle suspense of Apollo 13 and the tragedy of the shuttle Challenger. Intelligent, inspiring and accessible, The Space Age is a complete history of mankind's journey into space. (Part 4: Life and Death in Space) After visiting the Moon, humanity seeks to explore deep space and learn to live beyond the Earth. This requires extensive experimentation, and the building of NASA's first space station - Skylab. Thus begins a new stage in space exploration, heralding the replacement of rivalry with partnership; The International Space Station unites over a dozen nations - with Japanese, Canadian and European astronauts aiming to complete it by 2010. Meanwhile NASA's greatest asset - the Hubble Space Telescope - reveals what is waiting for us deep in space, having begun its life as NASA's most famous mistake. To land a human being on another celestial body will be the first step to living beyond our planet. The breathless pace and daring of the Apollo program sees NASA master previously unimagined tasks in the attempt to achieve the most incredible accomplishment in the history of human endeavor. From the ashes of tragedy on Apollo 1 emerges a determination that puts Apollo 8 in orbit around the Moon ahead of schedule. Apollo 9 and 10 each break bold new ground and pave the way for something few dared to believe was possible. When Neil Armstrong and Buzz Aldrin walk on the Moon and return safely to earth, the whole planet throws them a party.